Published: Nov. 11, 2018 at 03:27 p.m.
Washington Redskins quarterback Alex Smith launches a dime to wide receiver Josh Doctson for a 6-yard touchdown. Published: Nov. 4, 2018 at 02:16 p.m.
Washington Redskins quarterback Alex Smith throws a perfect fade pass to wide receiver Josh Doctson for a 2-yard touchdown. Published: Dec. 24, 2017 at 03:27 p.m.
Washington Redskins wide receiver Josh Doctson is left WIDE open and takes it the distance for a 48-yard touchdown. 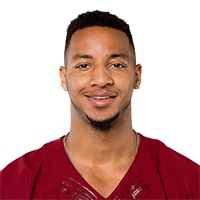 Published: Nov. 30, 2017 at 10:54 p.m.
Washington Redskins wide receiver Josh Doctson out-jumps Dallas Cowboys safety Byron Jones for a 14-yard touchdown.